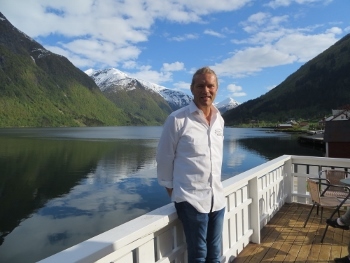 We were excited to wake up to the Bergen sun, and get ready to head to the wharf to board the morning Norled Express Boat, and start our “Sognefjord in a Nutshell” adventure. 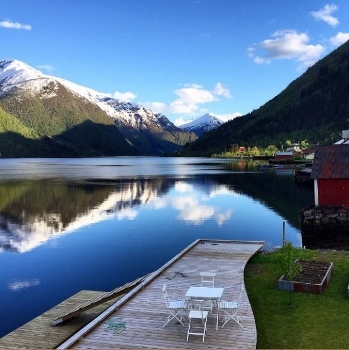 How do you see 4,000 fjords and 50,000 islands of Norway in 48 hours? 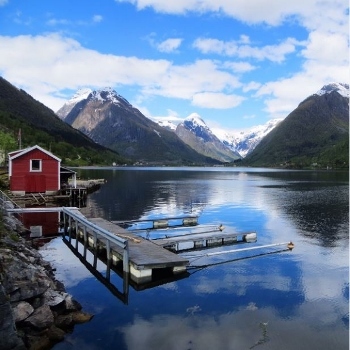 We heard this tour showcases some of the “best of Norway” that takes you to see beautiful fjords by boat, continuing with a spectacular train journey on the world famous Flåm Railway, then on the Bergen Railway to Oslo. Carved by glaciers long ago, the Sognefjord is the longest and deepest fjord, stretching 125 miles through the middle of Norway’s fjords. It’s called the “King of all the Fjords” and reaches the foot of the Jotunheimen Mountain. 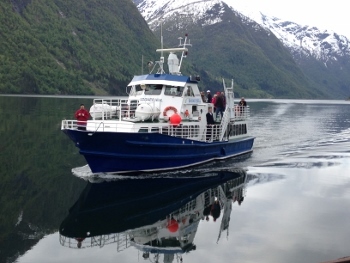 Sharing our spectacular experience through the fjords and wild mountain landscape of Norway. No wonder, National Geographic calls this area the “World’s Best Holiday Destination” with its dramatic landscape. 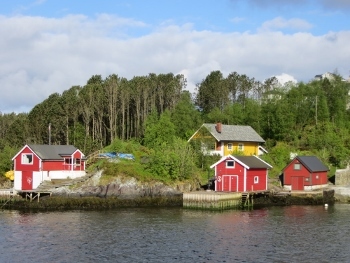 We see all manner of homes built into the rocks of the fjords–boathouses, Stave Churches, mountain farms, villages, lone homes, boats–all sizes and shapes, clinging onto the sides of the mountains. We see grass rooftops and slate rooftops, homes in nooks and crannies. Numerous waterfalls, lakes, roads, bridges. Every view takes our breath away. We wonder what it is like for the people who live in these remote and yet spectacular places year round. There are several stops along the fjord where young people back packing through Europe, bikers riding through the fjords hop on/off. After Viik, we stop at Balestrand which is at the entry of Fjaerlandfjord. 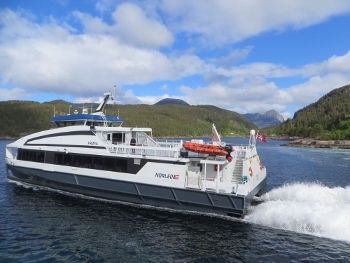 We step off the Norled Express, and onto a smaller boat, only a five minute transfer. We sit up on the top deck and bask in the beautiful sun. We love every moment riding up the fjord to Fjaerland. 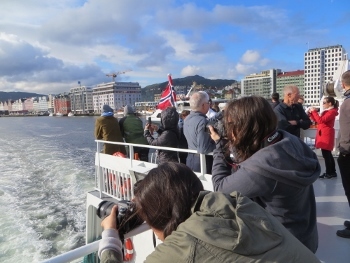 As we disembark, a bus is waiting to take all of us to the Glacier Museum–Norsk Bre Museum. 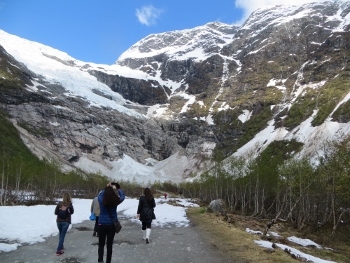 Director John Brekke gives us a tour of the museum, and highlights how Jostedalsbreen–the largest glacier on the European Continent and other glaciers are reacting to climate change. This interactive museum features a climate exhibition that helps visitors understand how global warming affects our planet, our home. Sir David Attenborough ends the exhibition with the words: “We still have time to act to make changes that will secure the life of this planet. This is the only home we have!” After our museum visit, the bus takes us to the glacial lake at the base of the glacier. We are able to walk around for a little and listen to the groans and shifts of the huge 25 foot glacier. 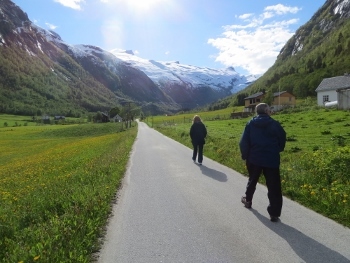 A walk through Fjaerland was a highlight of our fjord tour! We saw lots of farms–dairy, sheep–furrowed fields ready to plant . . .and were impressed by the local self-sustaining people. They build their own homes, raise their own beef/lamb, milk own dairy cows, make own cheese, have chickens and vegetable gardens/flower cutting gardens. A simple, quiet way of life. 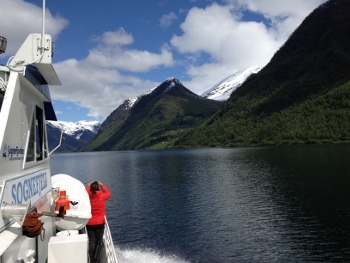 Everyone here lives the joys of fjord living – skiing, gardening, hiking, boating. 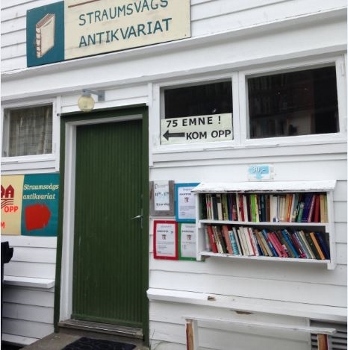 Fjaerland is also the 5th leading city” in the world in rare, lost, 2nd hand books. There are books everywhere in this village–anyone is welcome to borrow to read and then they are trusted to return the book. During our quick trip through Norway FjordsWe retired to our hotel for an incredible home cooked dinner –Chef Freya, Aneta, and Astrid prepared dishes with locally caught salmon, grass-fed beef, and homemade ice cream, and served us fresh lingonberry juice. The owner even makes the town beer, gathering junipers and processing his brew with glacial spring waters – it’s called “Fjaerland”. 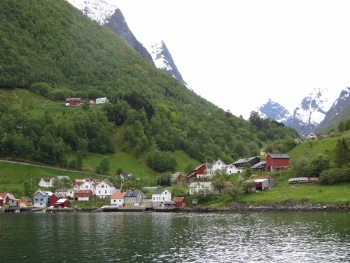 Although the sun was still out at 10:00 pm, we closed our night blinds, and slept well in this quiet fjord town. After a good night sleep, an idyllic farm Norwegian breakfast awaited us with homemade brown bread with nuts, honey served in honey comb, jams/marmalades, cheeses, vegetables, thin slices of ham and bacon, boiled eggs and freshly squeezed orange and apple juices. 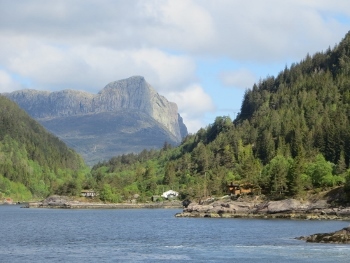 We wanted to linger in Fjaerland, but left for the wharf to catch a small boat for Balestrand, then onto Flåm. Along the way we saw fjord farms, villages, towns, a car ferry, small boats out fishing, campers/trailers with folks driving/working their way across the fjords. Numerous waterfalls, seals playing on rocks and sliding down the last lip of the falls into the sea, children at recess playing soccer. We were able to see so much during our quick trip to Norway Fjords. We passed by the narrowest fjord in Norway, “Naerøyfjorden,” and shortly thereafter, we saw the smallest Stave church in Scandanavia (room for 46) in the town of Undredal. The mountain farm, Stegen, still operates at an incredible 900 steep feet above sea level. 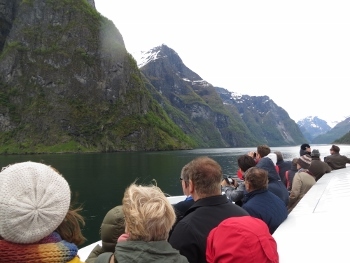 We are deeper into Songefjord now and turn into Aurlandsfjord–the huge cliffs are 4,500 ft. above sea level. Soon we arrive to Flåm and quickly get all our luggage ashore. 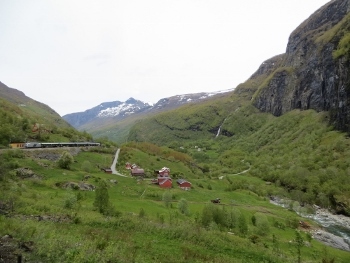 We arrive to the small village Flåm to catch the famous Flåm Railway to Myrdal. 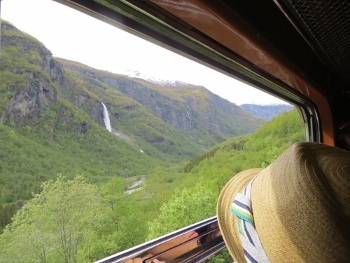 This 12-mile, 1 hour train ride is one of the steepest normal gauge railways in the world, with panoramic views of Norway’s incredible mountains, and Kjosfossen waterfall. 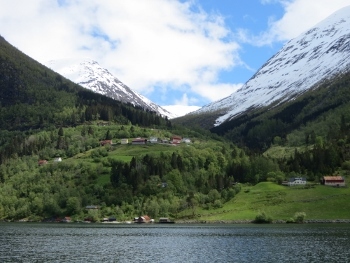 The name “Flåm” means “grassy plain.” It is a village of 400 people surrounded by mountains, waterfalls and valleys. The innermost village is filled with fruit trees and berry bushes–normally they could not grow in this climate, however the way the mountains are formed allows for a warm gulf stream that makes the climate perfect for this. 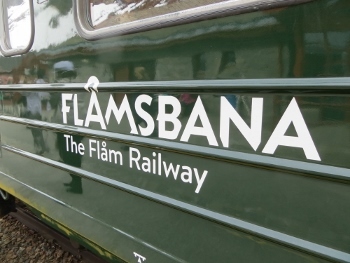 Flam welcomes over 300,000 visitors a year–many come by railroad, and cruise ships. We have a couple hours before our train departs, so we find a driver to take us to Borgund to see the most well preserved Stave Church. Rikkard, our driver, knows the way through 4 tunnels (one is the longest in the fjords, 15 miles! ), and several river valleys. We see many farms, an archeological site from Viking era, rivers belonging to the “Salmon Lords” in Flamselva. A Stave church or “stavkirke” is a Nordic wooden Christian church building once common in NW Europe. There are only 29 left, one in Poland and 28 in Norway. They are a part of Norway’s medieval architectural heritage, each featuring wooden staves, gables, a cupola and a series of pitched roofs. They were all built between 1000 and 1310. 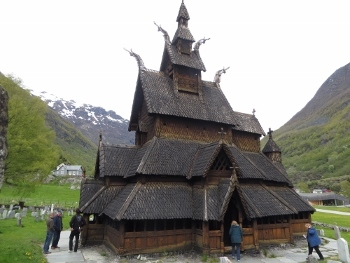 The Borgund Stave Church is standing as a continual whisper to all living of those who have gone before. It was built in 1180. The roof is tarred, a way to prevent from weather. It’s foundation is rock. It is small, but enchanting. Lots of excited people in line for the famous Flåm train, and we all climb aboard. 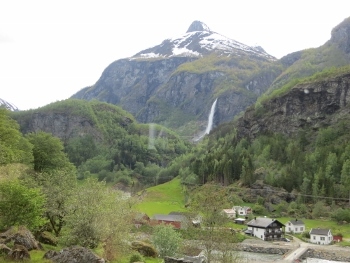 As we ride up through many little towns, farms, waterfalls to Myrdal at the top of the fjord mountains. 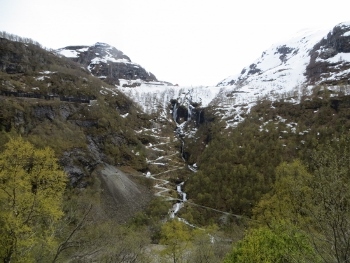 We pass through valleys, steep mountains, and see Kjosfossen–a 250 foot waterfall, on our climb up to Myrdal. 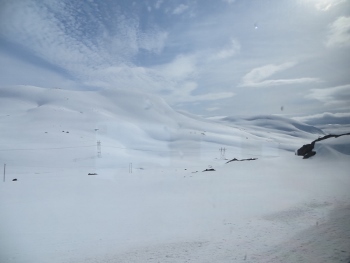 Myrdal is surrounded by snow, and we wait in the station for an hour before transferring to the opposite platform to board the Bergen train headed for Oslo. This is the highest altitude railway in Northern Europe that runs through some of the most beautiful high mountain terrain. We depart Myrdal, and wind through so much deep snow and icy lakes. It is everywhere–white, thick, blanketing the tops of the high mountains. We are stunned to see homes in Finse, buried up to the roof tops. We make our way through valleys and rivers–beautiful, well-kept farms. Now heading for Norway’s capitol, largest city with a population of 565,000. It has been the capital of Norway since 1299 when King Hakon V. Magnusson moved residence from Bergen to “Christiana”–a sheltered location– in Oslofjord–known today as Oslo. 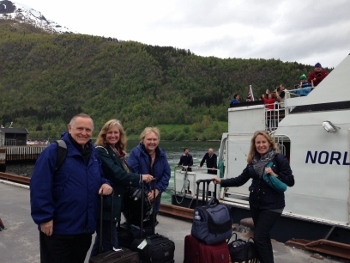 The Global Adventuress Team would like to thank the Norway Tourism Board, and Fjord Tours for hosting our “Sognefjord in a Nutshell” Tour! A special thank you to Fjaerland Fjordstove Hotell in Fjaerland for hosting us and sharing their fjord hotel with us. 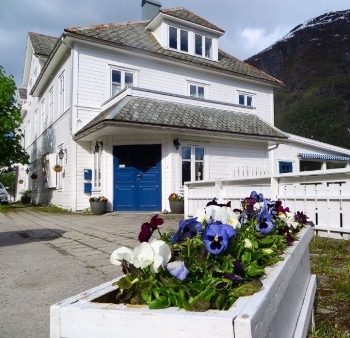 Fjaerland Fjordstove Hotell We highly recommend staying at this charming hotel with spectacular views of the fjord, glaciers and mountains. 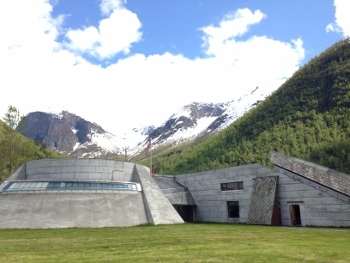 Norsk BreMuseum Visit this museum to gain insights on the surrounding Norway glaciers, climate changes, and how our choices make a difference. Travelpro The choice of flight crews and frequent travelers and Global Adventuress! We love our merlot carry on spinner and take it everywhere we go. DK Travel Guides Excellent book with maps, great photos & helpful information to plan your trip to Norway.